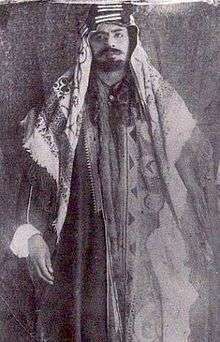 Abdulaziz bin Mithab (Arabic: عبد العزيز بن متعب‎‎) known as Ibn Rashid, was the Emir of Jabal Shammar from 1897 to 1906. A son of the third Rashidi emir, he was adopted by his uncle Mohammed, the fifth amir, and brought up to be his heir. After Mohammed died of natural causes, Abdulaziz succeeded him unopposed. However, the Rashidi rule was insecure, as their Ottoman allies were unpopular and weakening. In 1904 the young Ibn Saud, the founder of Saudi Arabia, returned from Kuwait with a small force and retook Riyadh. Abdulaziz died in the battle of Rawdat Muhanna with Ibn Saud and Mubarak Al-Sabah in 1906 after several other battles with Saudis.